As an East Coaster and avid Bagel lover, one of my greatest concerns about coming to Wisconsin was finding a good bagel spot! Nothing is more necessary for a good study session or a bad hangover than a good bagel. For weeks after I arrived for my first semester, I scoured Madison’s downtown breakfast restaurants and coffee shops, only to be disappointed by chewy bagels and strange looking lox. My quest seemed hopeless until I was tipped off by a friend about Gotham Bagels, owned and operated by a couple of New Yorkers, with supposedly the “best New York bagels in Madison.” Based on my disappointment with Einstein’s or the Sunroom Café, both decent places for coffee or pancakes but not the bagels I longed for, I was skeptical. However, my skepticism immediately abated the moment I stepped into Gotham. The line outside the door was a good sign, but I was sure I’d found the bagels I was looking for the moment I spotted that scallion cream cheese and their oversized, super egg everything bagels. When you go to Gotham, located right by the Capitol on the corner of Mifflin and North Hamilton, the only problem you’ll run into is having to choose between their plethora of hot and cold bagel sandwiches. 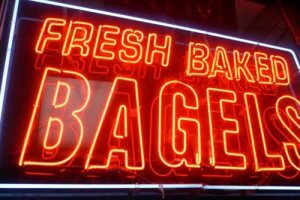 I’m usually torn between the “Brighton Beach,” an onion bagel with smoked salmon, caper cream cheese (which I usually replace with scallion), tomato, and onions, or the “Yellow CAB,” an egg bagel with bacon, avocado, cheddar cheese, mayo, and tomato. If you’re looking for something more sweet, I highly suggest their whole wheat honey bagel with walnut raison or honey and tart cherry cream cheese! Whatever you order, I promise that Gotham’s bagels rival those of New York’s Zabars. You will not be disappointed!